Photo Two: Tow ropes were an early way to get up the hill. Editor’s Note: In honor of Okemo’s upcoming 60th anniversary, this is part one in a series on the area’s growth to one of the nation’s top 15 ski resorts. The story behind the development of Okemo Mountain is a story of humble beginnings, risks taken, challenges met, and consistent progress despite frustrating setbacks. It is also a story of 27 years of management by committee, which, oddly enough, met with almost instant success. Despite many changes on the board of directors and in general managers, Okemo, which opened for skiing for locals on Jan. 31, 1956, and to the public the next day, became the longest, most successful sharehold-owned and community-supported ski area in Vermont before it changed hands in 1982. That change to majority ownership by Tim and Diane Mueller (eventually sole ownership) set the mountain up for more success. In fact, it propelled the ski area into the popular year-round resort that the dreamers of 1935 and the founders of 1955 had forecast. But even they and the Muellers never foresaw just how big and successful the mountain would become. Seeing “a diamond in the rough,” Tim Mueller had ignored a warning in 1982 that he “could lose everything. We were willing to take the risk because the potential was so great . . . We had little ski experience but a lot of energy. We also knew that there were experienced employees we could depend on,” he said. Diane added, “We assumed we would be successful because that is part of being an entrepreneur, but never in our wildest dreams did we foresee Okemo reaching 600,000 annual visits or operating three ski resorts. That was not a goal then.” (Today, as Triple Peaks, they also operate Mt. Sunapee, N.H., and Crested Butte, Colo.) Now with 667 acres, a 2,200-foot vertical, 20 lifts, 121 trails, 7 terrain parks, halfpipe, snowmaking capability on 654 acres, and a footprint that is over 2 miles wide, Okemo is also one of the top two areas in Vermont and the East, as well as one of the top 15 in the nation, as measured by skier visits. Winter sport was catching on in Vermont in the 1920s, and Ludlow was one of several towns to have its own local sport clubs. Okemo Mountain Club, Finnish Athletic Association, and Veikot Athletic Club all participated in skiing on Okemo and sponsored ski meets and winter dances. Visitors were soon joining them. Members of the Appalachian Mountain Club of Boston explored the mountain and lakes around town during a February vacation week in 1921, providing one of the earliest “Washington’s birthday weeks” for Okemo. Winter carnivals followed. So did the snow trains, which brought skiers and snowshoers up to Vermont from cities like Boston, Hartford and New York. In the 1930s, State Forester Perry Merrill began buying up lands for the state with a goal of creating four-season recreation. One of his biggest plans was for Okemo, where the state had purchased 4,000 acres for a new state forest. Plans included a three-mile auto road to the summit; a ski jump; hiking, skiing, and horseback riding trails; campsites; and picnic areas. While avid sportsmen and local businessmen supported this plan, there were those in the state who criticized Merrill’s land purchases and delayed his goals. They objected to the use of state funds for recreation after the Great Depression, a stance that delayed a major industry for Vermont. Although Okemo’s auto road, campsites and picnic areas, and a fire “lookout” tower were built by the Civilian Conservation Corps under Merrill’s direction in 1935-36, no tows or ski jump were installed. However, enterprising skiers put in rope tows, which had been introduced in Woodstock in 1934, in Cavendish and Proctorsville and, in 1938, off Route 100N in Ludlow. During the 1938-39 season, cards were printed extolling Ludlow as “the Snow Town of Vermont” to attract visitors, and winter carnivals resumed. Despite continued interest and support for a ski area on Okemo, the world situation was changing and soon men were training on skis on Okemo for the mountain troops that would serve in the 10th Mountain Division. When the troops returned home, the development of ski areas took off nationwide. Ludlow was one of the few Vermont towns that had always enjoyed relative prosperity due to its woolen, lumber, and furniture mills. However, with the demise of the mills, local business leaders were looking for a way to benefit the local economy by developing a ski area on Okemo. They met with Perry Merrill, who said the state would lease them land on the upper mountain and construct a ski shelter/restaurant building and parking lot below. Local meetings were held and stock was sold at $10 a share; with $300 Okemo Mountain, Inc. was formed in January 1955. The leaders also arranged to buy the private land on the lower mountain for ski operations and set up a board of directors. The founders extolled Okemo’s potential, citing: 3 million skiers (probably an exaggeration) on the East Coast; a substantial mountain; a location in a heavy snowbelt; the half-mile proximity to Route 103; proximity to major population centers like Boston, Springfield, Hartford, and New York; and a town already in place at the foot of the mountain, which could offer skiers lodging, food, and other services. The founders also contacted Andrew “Bud” Titcomb, who had learned to ski in Switzerland, skied for Dartmouth College, and raced throughout Europe in 1937. He helped cut famous New Hampshire ski trails, including Hell’s Highway and the Taft Trail, and was an incorporator of Sugarloaf (Maine), helping to cut the first ski trail there. He had become an architect and was living in Perkinsville when he was brought to the board’s attention. On April 12, 1955, Titcomb and John Connor climbed up to the fire tower. Connor “snowshoed down and I skied down. When I reached the bottom, the directors were all waiting for me, wondering what I thought. I said, ‘It’s FANTASTIC! I think you’ve really got something here,’” Titcomb recalled in a 1992 interview. On April 28, he climbed the mountain again, this time with Charlie Lord, an engineer and trail designer; Perry Merrill; and Joe Jones, a former ski racer and coach, who had helped build Middlebury College Snow Bowl. They found no snow at the bottom but three feet at the top. On a repeat visit Titcomb, Jones, and Lord surveyed the mountain and with their input, Titcomb drew up plans for the first lifts and trails. Enthusiasm was one thing; selling stock to raise the $125,000 necessary to get the area off the ground was another. With just $40,000 sold by Oct. 1, 1955, the directors hired a local retiree to sell stock. Accompanied by a local banker, the pair sold almost $100,000 in shares by mid-December, something of a record for stock purchases used to start a ski area in Vermont. The first directors of Okemo followed Titcomb’s suggestion to install Pomalifts, which he felt were “good fast, fast efficient lifts that were easier on skiers than rope tows but less expensive than chairlifts.” Titcomb noted that the first Pomalifts had to go in at an angle on the lower mountain to avoid crossing the Mountain Road that the CCC had built for summer auto travel. In addition to a 1,700-foot lower Poma for beginner terrain, workers installed a 6,207-foot upper lift (Red Poma), which served a novice run (Mountain Road) and an intermediate/advanced trail, the Tomahawk. The two lifts served an overall 1,900-foot vertical, one of the greatest in Vermont at that time. The upper lift was the longest Poma in the country and reportedly the longest surface lift in North America. Due to lack of snow and then a washout, Jean Pomagalski, who came over from France to test the upper Poma in January 1956, found the ground bare, so he foot-pedaled his way up. 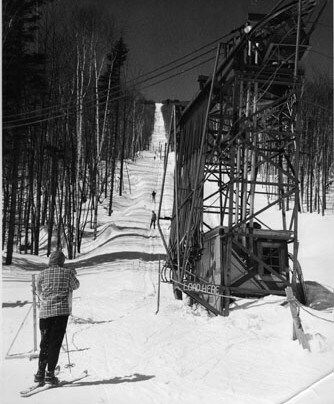 It was Jan. 31, 1956, before Okemo could open. That day locals sampled the snow, and on Feb. 1, the area officially opened to the public with three trails, a summit warming hut (the Wigwam), Okemo’s small warming hut/base lodge, a ski school, and a ski patrol. With 800 skiers for the inaugural weekend, Okemo was finally operating.